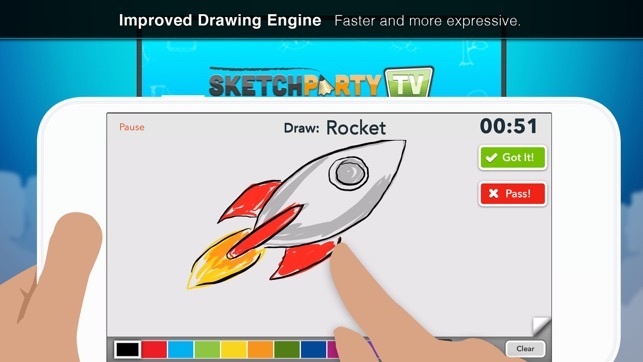 The drawing game for Apple TV! NEW! Completely redesigned. Dark Mode. Drag-and-drop Team setup screen. Time bonuses awarded for speed. As seen in WWDC keynote! 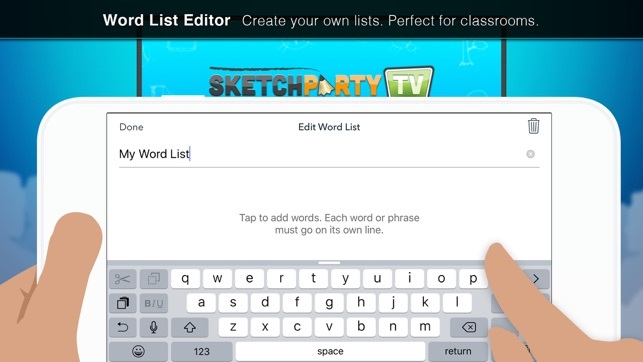 SketchParty TV is the fun Pictionary-style drawing and guessing party game to play on your iPad and Apple TV! You could buy an easel, a huge pad of paper, and some markers, then write down a really long list of words and make up some rules and try and keep track of points and get marker smudges all over your furniture. But who wants to do that? 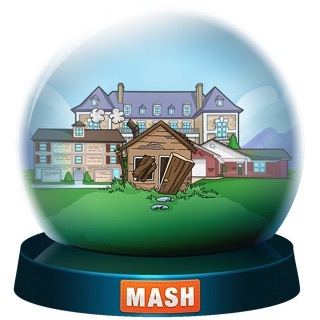 You could play a fun drawing game using items you already have around the house, like your iPad, high-definition television, and Apple TV. Just enable AirPlay Mirroring, choose sides, and start a SketchParty. It's so simple! 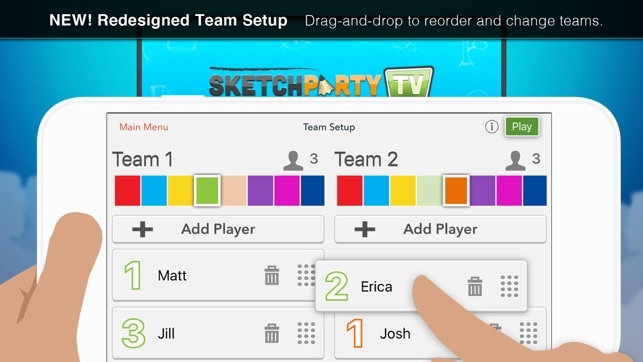 SketchParty TV is a team game like Pictionary or "Win, Lose or Draw", and up to 8 players per team can join in on the fun. That's a pretty big party! And it's fun for ages 8 and up. Gather up your family, call your friends, and SketchParty today! Engadget/TUAW and Mac|Format Magazine Editor's Choice app. As seen on ABC, Macworld, Fortune, Mashable, Techcrunch, Gotta Be Mobile, MacStories, iMore, Touch Arcade, 148Apps, The Loop, and more. Check out TRUTH TRUTH LIE on the iMessage App Store. How well do your friends know you? • Team Setup screen can now display the Connect screen if Apple TV is not yet connected. • Fixed layout issue for Team Score breakdown screen. • Fixed an issue with version compatibility check. • Minor saved game database updates. • Other minor bug fixes. Update!! I heard from the developers and they worked on a fix! Since the last update early July 2018, this has been a blast to play on my SE and the whole family has loved it. Thanks! old version review-Since the touch on the screen does not correspond with the resulting line being drawn, it is beyond maddening. The most fun you’ll have is when you give up and just starting laughing at the app for failing so much. Glad to hear this issue was resolved. 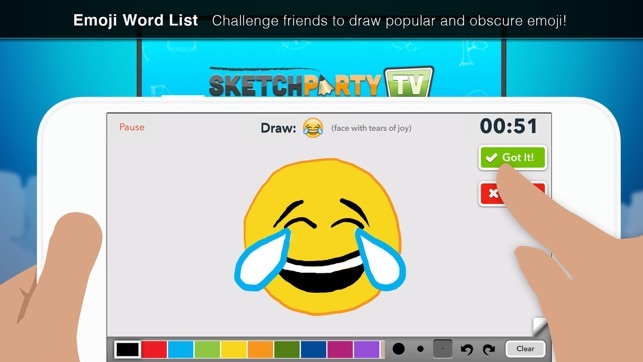 Thank you for playing SketchParty TV! I have been playing this game over a year without a single crash, delay or hiccup. None of my friends are super artistic and those slightly inclined this game levels the playing field enough to be fun for everyone! Some people have connection issues or out of sync(delayed). I don’t know how theirs is setup or maybe using an old router. Thank you for the kind words, we're really glad you enjoy the game. Thanks for playing SketchParty TV! No matter if you are doing tv mode or through airplay this is littered with connectivity issues. Don’t waste your money on a game that works for a partial amount of time. I am running and iPad Pro and an Apple TV 4K yet somehow it cannot stay synced. I have a strong reliable network powered by an Asus AC 3100. Apple TV has direct connection with network, still unable to maintain a good connection. App is not worthy of the 5 star reviews that it has.